Margaret Thatcher was the first woman ever to become British Prime Minister as well as the first woman to head a European government. She was born on October 13, 1925. Her birth name was Margaret Hilda Roberts. Her father Alfred Roberts was a grocer and local alderman who later became the mayor of Grantham. Margaret Thatcher graduated from Oxford University in 1947 with a chemistry degree. She worked as a food scientist developing soft-serve ice cream before getting active into politics. Margaret Thatcher still remains a controversial figure, even after death. Being known for her personal and political toughness, she got the nickname ‘Iron Lady’. She ran for Parliament in 1950 for the very first time but was unsuccessful. She was the youngest candidate to stand for a seat in the House of Commons being only 24 years old. In 1959, Thatcher won a seat in the House of Commons with a seat in Finchley, in north London. 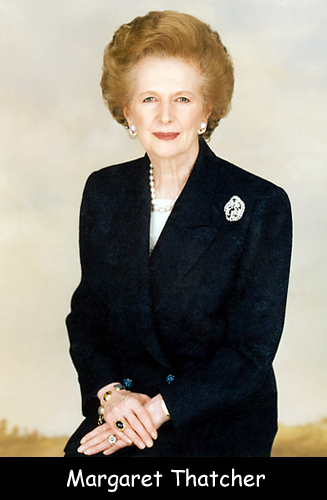 She was the longest-serving prime minister of the United Kingdom of the 20th century. In the Falkland Islands, Margaret Thatcher Day is celebrated every year on Jan 10th. It is not a public holiday. From 1961 to 1964, she served as a parliamentary secretary in the Ministry of Pensions and National Insurance. In 1991, Thatcher received the US Presidential Medal of Freedom from President George H.W. Bush. In 2008, her daughter confirms that Thatcher is suffering from dementia, first noticed in 2000. On April 8, 2013 she suffered a stroke which caused her death. Declan, Tobin. " All Facts for Kids about Margaret Thatcher ." Easy Science for Kids, Apr 2019. Web. 26 Apr 2019. < https://easyscienceforkids.com/margaret-thatcher/ >.